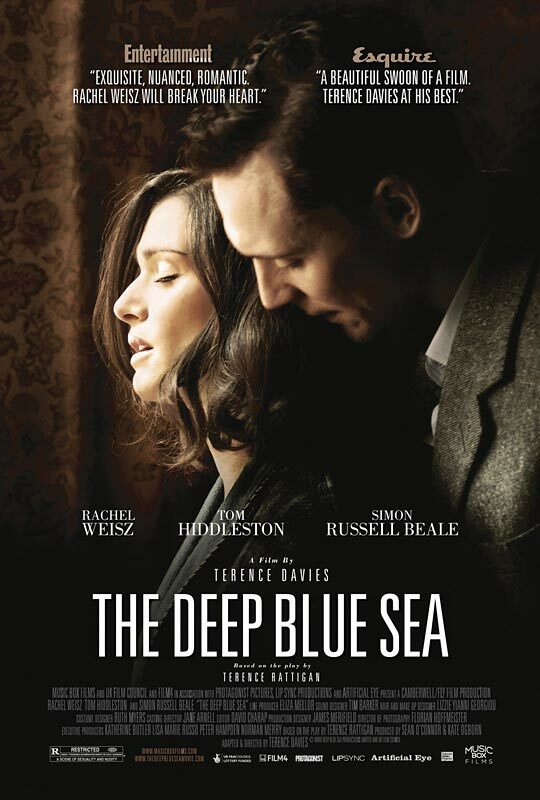 Rachel Weisz teams up with director Terence Davies in “The Deep Blue Sea”, a sad and heartbreaking tale of love gone beautifully right and amazingly wrong. Davies masterfully adapted the film, based on the play by Terence Rattigan, with an incredible eye for details. It’s a simple story for sure, set in 1950, but the film is filled with emotional fireworks, and Davies expresses those emotions with special treatment- with a hauntingly beautiful soundtrack, dreamy scenes, and great performances by Weisz, Simon Russell Beale and Tom Hiddleston. Here’s what you need to know: Weisz ends her marriage to the much older Sir William (Beale) when she falls madly in love with former WW2 pilot Freddie Page (Hiddleston). She’s a better person when she’s around him, despite his hard drinking and anger problems. Their scenes together are electric. If I tell you the entire movie is a study of one woman’s torment, chances are, you might find it unappealing and uninteresting. But truth be told, the story is riveting and completely absorbing from beginning to end, mainly because all the characters give us rooting interest, which is always crucial in films like this. On most occasions, we’re watching Weisz, but sometimes we’re watching Simon Russell Beale as the husband, as he uses every bit of dignity left in him to contain an impulse to burst into tears (now that’s what I call acting!). As for Hiddleston, he’s an actor of tremendous talent, and “The Deep Blue Sea” is proof of that. But at the end of the day, this is the world of love as seen through the eyes of Weisz’s character, and to suffer with her for 90 minutes is a risk you’d be willing to take.